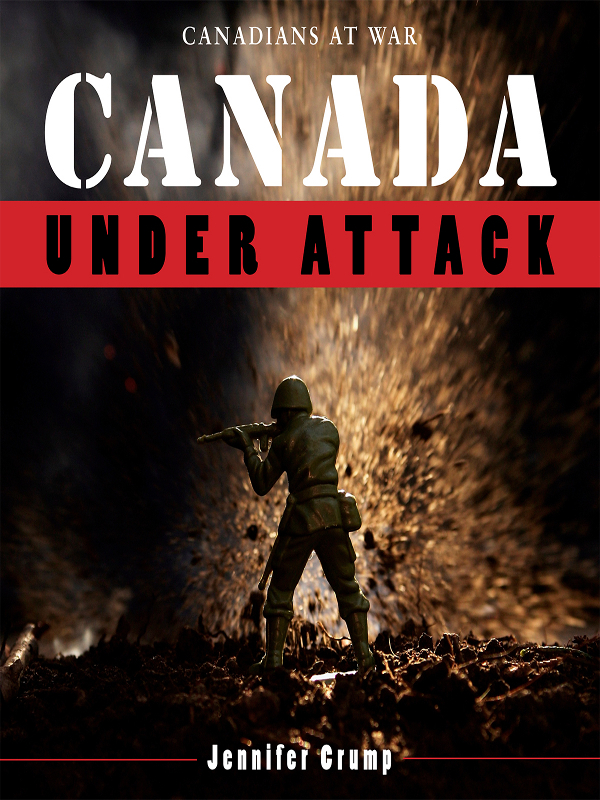 Canada under attack : Canadians at war / by Jennifer Crump. 2. Canada--History, Military. I. Title. To Alex, Laura, Emily, Alexandria, Kathleen, and Danielle. , journalist Peter Carlson concluded that while, “invading Canada is an old American tradition ... Invading Canada successfully is not.” Carlson made that observation while covering a story on the declassification of War Plan Red, a 1935 document outlining the most recent U.S. plans to invade Canada. Carlson may have had a point. Canada has been the scene of many invasions throughout its history. Our rich natural resources, kilometres of coastline, diplomatic ties, and proximity to the United States have made us a tempting target for the Americans and for other countries. Britain, France, Germany, Spain, Japan, and even Canadians themselves have launched invasions. Some of these wars have been waged as part of a much larger conflict; others have focused on more local concerns. Wars that started on the European continent have frequently spread to Canadian shores and several have been concluded on Canadian soil. The Seven Years War involved nearly every major power in Europe and has been referred to as the first “world war.” Battles were fought in Europe, Africa, and Asia, and on Canadian soil when the French attacked St. John's and the British invaded Louisbourg and Quebec City. Some invasions occurred as part of a larger North American crisis like the American Revolution. Others began as local squabbles that erupted into global incidents. The Nootka Crisis began as a battle over a small patch of coastline on Vancouver Island and brought Britain, Spain, Germany, the Netherlands, and France to the brink of war. The Nootka Crisis claimed few lives, the Aroostook War none, but other major invasions like the War of 1812 took thousands of lives. The Battle of the St. Lawrence lasted for three years, the invasion of James Bay just a few days. As Carlson pointed out, those invasions share one common theme: few succeeded and none succeeded for long. Invading Canada has been a long-time tradition for many nations. Invading Canada successfully has not. For centuries the ships of numerous countries visited Canada's eastern shores to reap the riches they found there. They would sail back to their home ports with their holds full and purses fat with profit. Norse, Italian, Spanish, Portuguese, British, and French fishermen all plied the waters near present-day Newfoundland. Some of the more adventurous among them would venture deeper into Canada, exploring its rivers and great inland seas in the hunt for furs. While the Norsemen quickly abandoned the eastern shores of Canada and the Italians, Spanish, and Portuguese never settled the area, the French and English were soon engaged in a race to control the lucrative fishery and fur trade. Their approaches were initially quite different. The French preferred to have the furs delivered to them at Montreal, while the English preferred to set up shop closer to where the furs were. In 1670, the Hudson's Bay Company was created and its founders established Fort Charles on Hudson Bay. As the company expanded, they built additional posts at the mouths of the Moose and Albany rivers on James Bay. During the winter the posts were abandoned as the traders returned to Britain with their ships full of furs of every description. The French sent their own expedition to the area and made a show of claiming the land in their king's name, but there were no Englishmen there to witness it and whatever Native witnesses were in the area probably found the ceremony perplexing rather than threatening. For the next 10 years, the French and English traders grew more competitive although there were no outward signs of aggression until 1682, when traders from Britain, France, and New England all tried to claim the same trading post. The French won the initial argument but were pushed out by the British two years later. In 1686, the new governor of New France, Jacques RenÃ© de Brisay Denonville, decided to avenge this challenge to French sovereignty and to once and for all put an end the English presence on what he considered to be French soil. When the French government refused to lend him naval support he decided to organize and fund his own audacious overland attack on the Hudson's Bay Company posts on James Bay. In March 1686, Chevalier Pierre de Troyes was chosen to lead the attack. De Troyes began to gather provisions and recruit troops; 100 men would eventually join the expedition. Among them was the infamous Pierre le Moyne D'Iberville and two of his equally famous brothers. D'Iberville was one of 12 children born to one of the wealthiest citizens of Montreal, Charles le Moyne. Like his brothers, Pierre was a career soldier and a dedicated adventurer. peoples, and intense loyalty to French Canada, they left a lasting legacy. ing a mission in which he captured a large English ship with only two small canoes. and Quebec City and rose rapidly in the military serving in France and Canada. on generous pension granted to him by the king until the age of 88.